Bulgaria's ancient Thracian heritage has been thrust into the spotlight this year with a number of key archaeological discoveries in the so-called "Valley of the Thracian Kings". The golden treasures are attracting international attention and there is a push to make the Thracian heritage Bulgaria's trademark abroad in a bid to boost tourism in one of the poorer East European countries. Even the local people cannot believe that Bulgaria, with an income per capita reaching less than a third of the EU average, has managed to unearth kilos of pure gold worth millions of dollars. But, for many, there is more interest in a tapping a richer vein as property sales to foreign buyers are going through the roof. Among the latest archaeological finds was the discovery of a 2,400-year-old Thracian shrine near the small town of Shipka, in the very heart of Bulgaria. Experts say it contains the burial of local king Seutus III - a mighty rival to Alexander the Great. The shrine consisted of three chambers buried under a big hill. The entry was sealed with a marble door, a masterpiece in itself. In the first chamber, there lay the skeleton of a horse. But the real treasure waited in the third. The team went in to find a lavishly arranged burial place, a gold wreath and objects lying around. Described by Herodotus as "savage, blood-thirsty warriors"
It took the archaeologist several minutes to realise that the cracking sound under their feet came from smaller gold parts lying all over the place. Ancient findings such as this are not uncommon for this area south of the Balkan Mountains, aptly named the "Valley of the Thracian Kings". 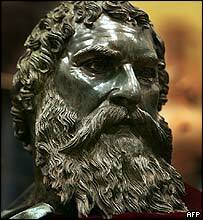 Weeks earlier the same team had discovered a rare gold mask. Scientists compare the new find to the discovery of King Agamemnon's tomb in Mycenae by Heinrich Schliemann in the 19th century. Archaeological excavations have therefore taken centre stage in Bulgaria. The Bulgarian media rediscovered the Indiana Jones type mystery of ancient civilizations and 2004 became "The Year of the Archaeologists". 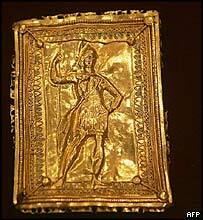 Public emotion went as far as the idea of using the new gold treasure to promote Bulgaria, under the logo "The Valley of the Thracian Kings". But can ancient gold change Bulgaria's image and attract foreign tourists and investment? Historians themselves are not really fond of the idea. The director of The National Archaeological Museum told the BBC the real treasures are not the gold objects, but the tombs discovered in the area. About a dozen of these tombs are really interesting and can attract foreign visitors if an adequate infrastructure is developed. Putting the ancient gold to work is not a new idea for Bulgaria. Three other earlier, and much bigger treasures, are touring Europe, America and Japan under the general title "The Thracian gold". These exhibitions started long back in communist times. The result so far is that they can hardly ever be seen in the country. However, public relations experts admit it is difficult to judge to what extent, if any, these exhibitions have increased interest in Bulgaria abroad. Even if such treasures were to prove worldwide success (the organisers of the Expo 2005 in Japan have already invited the new treasure for an exhibition), for Bulgarians there might be a better shortcut to prosperity. The last two or three years registered record property sales in areas close to the Black Sea coast and in Bulgaria's mountain resorts. 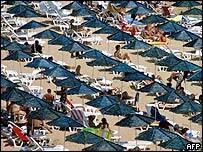 Many British and German buyers are being drawn to Bulgaria, attracted by lower property prices, a longer summer, beautiful countryside, cheap natural food and a generally easier living for people with Western pensions in a country with a much lower cost of living. The trend is welcomed by local people who can otherwise barely subsist on their own modest pensions. Gossip between neighbours over the fence as to who sold what for how much to a foreigner has become a common subject for conversation - an interest the Thracian gold is yet to arise even in the hearts of Bulgarians themselves.